The first time I saw a wind turbine was on a drive from Cincinnati, Ohio, to Madison, Wisconsin. The wind turbines were visible from the road, towering over flat fields in Illinois as far as the eye could see. They steadily turned in the breeze sweeping across the plain. I snapped a picture as we drove and sent it back to my family. The turbines were an oddity. A curiosity. A little niche that was something to marvel at, but we were still skeptical of its future. Renewable energy is gaining ground. Investors need to be ready to jump on this opportunity. Countries around the globe have made significant investments in renewable energy. It’s starting to make a significant difference. Great Britain reported that more than 40% of its energy was coal-produced in 2012. Last year, coal-produced energy accounted for only 7%. Wind energy accounts for 15% of the energy produced, up from 10% in 2016. What’s more, new offshore wind farms are still coming online. The Dudgeon wind farm off the Norfolk coast just started providing energy. The Rampion wind farm near Brighton also came online. 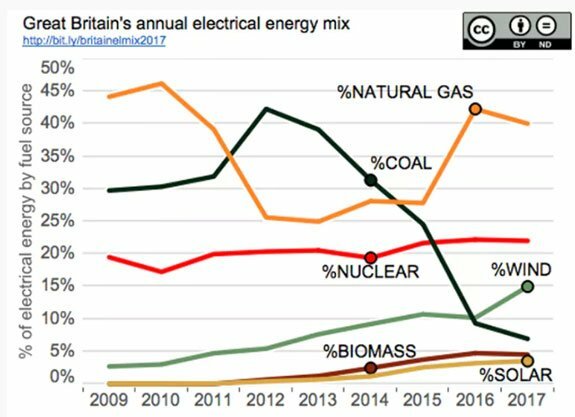 Wind energy output increased by 14 terawatts from 2016 to 2017 in Great Britain. That’s enough energy to power 4.5 million homes. A short distance away, Germany hit a new record. Preliminary reports showed that on January 1, renewable energy sources met 100% of the country’s energy use for a brief period of time. In 2017, renewable energy met 36.1% of Germany’s power needs. In 2016, renewable energy met 32.3% of Germany’s needs. And it’s not just Europe that’s enjoying a renewable energy boom. French company Voltalia announced that it won contracts to build a wind farm in a region of northern Brazil. This area can produce more wind power than any other area in the world. The new wind farm will produce the cheapest wind power Brazil has ever seen. Wind farms need massive amounts of room. That’s why one Dutch company has come up with an innovative solution. Moving offshore. Really far offshore. TenneT has proposed the creation of the world’s largest wind farm with a central man-made island serving as the power hub. Built on a massive sandbank called Dogger Bank in the North Sea, the wind farm would have an estimated capacity of 30 GW. That more than doubles the total installed offshore wind power across all of Europe today. The power from TenneT’s project would be available to the Netherlands, Norway, Denmark, Germany, Belgium and the U.K.
Renewable energy is reaching a critical level. A tipping point. The key zone where a product, service or idea moves from niche to widely accepted. And one of the key components of the shift for renewable energy has been price. 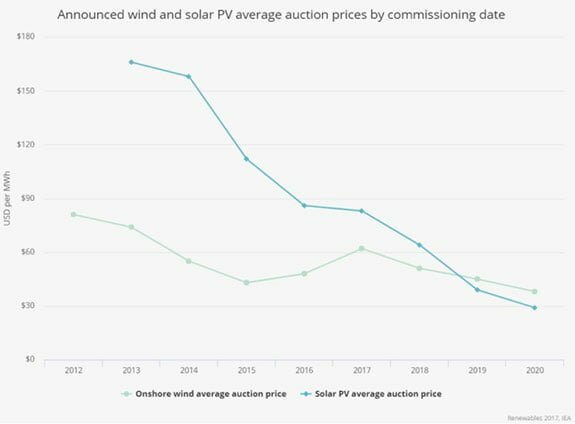 The price of renewable energy has seen a significant drop. Prices are expected to keep declining over the next several years. The International Energy Agency has seen auction prices working to effectively reduce costs for offshore wind power. The price drop in renewables will result in a faster adoption rate, increasing demand for more wind turbines and solar panels. This is a sector worth digging into for 2018. Even Paul Mampilly has identified an opportunity within the renewable energy sector that you should consider. Don’t miss your chance to jump on this booming sector as demand skyrockets.